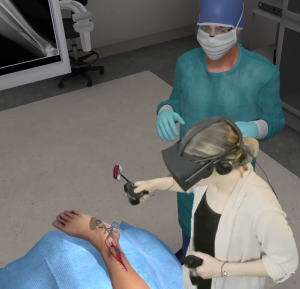 Dr. Bauman led this award-winning collaborative project with a talented team of academic and industry colleagues including the renowned educational game studio Filament Games. Saving Lives! is a CPR/AED simulation mobile game for EMS, medical, nursing and allied health students and professionals. Saving Lives! Is part of the www.app-clinic.com portfolio of mobile games supporting health sciences education. Saving Lives! 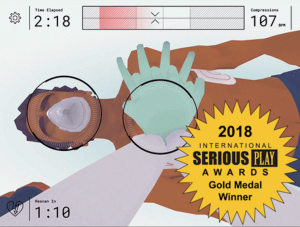 won the 2018 International Serious Play Gold Medal. Click here to read more about the award. Click here to read the interview with game designer Matt Haselton about this project. 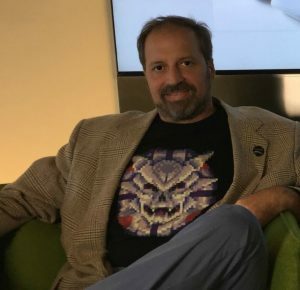 Read the interview and discussion with Dr. Eric B. Bauman by Filament Games Director of Marketing and Outreach, Brandon Pittster. The discussion focuses on the intersection of game-based learning with health professions education. Click here to read the interview. Together with the talented Jon Bouchard and Brian Pelletier of Arch Virtual, Dr. Eric B. Bauman worked on a project for Envision designed to provide high school students with a virtual reality-based immersive experience focused on authentic surgical procedures, including cleaning a wound, injecting lidocaine, repositioning a broken bone, stapling skin, and applying a bandage. Dr. Bauman’s role focused on providing subject matter expertise focusing on medical, healthcare and best practices for the multi-media components of this educational experience. Click here to watch a video of this experience. Dr. Eric B. Bauman is well known for his deep experience related to simulation and clinical education, particularly in the area of airway management. To some extent, this exciting award-winning project is an extension of his first publications titled An evaluation of bag-valve-mask ventilation using an ergonomically designed face-mask among novice users: a simulation-based pilot study. Collaborators on this project included Arch Virtual and a number of Dr. Bauman’s colleagues throughout academia and industry. The INACSL/CAE Healthcare Simulation Fellowship has been co-developed by INACSL and CAE Healthcare Academy and offers global participants the opportunity develop and hone their simulation-based education skills related to design, facilitation and debriefing using the INACSL Standards of Best Practice: Simulation SM for use in all areas of healthcare simulation. Dr. Eric B. Bauman partners with Dr. Cindy Foronda to provide a module on simulation titled: “Beyond the mannikins – virtual reality and game-based learning”. Clinical Playground, LLC is providing consultation for Kinglsey Elementary School (District 203) in Naperville, IL. Discussion and consultation includes best practices and evaluation related to game-based learning. 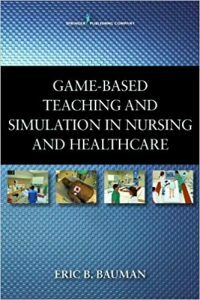 Renowned nursing scholar and leader Dr. Pamela Jeffries provides the forward for Game-based Teaching and Simulation in Nursing & Healthcare. Dr. Jeffries is Professor and Associate Dean for Academic Affairs for the School of Nursing at Johns Hopkins University. Jeffries is well known and recognized for her scholarship in simulation-based learning and the use of emerging technologies in nursing and clinical education. All of the authors are excited to have received endorsements from Drs. Kurt Squire and Suzi Kardong-Edgren. Dr. Squire is Associate Professor at the University of Wisconsin – Madison, School of Education and is a founding and core faculty member for the Games+Learning+Society research group. Squire is one of the preeminent voices in the Games-Based Learning movement. Dr. Kardong-Edgren is Assistant Professor in the College of Nursing at Washington State University. Kardong-Edgren is also Editor-in-Chief of the journal Clinical Simulation in Nursing. Clinical Playground, LLC Founder and Managing Member, Eric B. Bauman, PhD, RN is delighted to be working with Parvati Dev, PhD on the CliniSpaceTM virtual environment project. This project recently won the prestigious Grand Prize in the 2011 Federal Virtual Worlds Challenge and First Prize in the “Artificial Intelligence in Training “ category. Clinical Playground, LLC is working with Dr. Dev to develop the narrative and scripting elements for a virtual world multi-professional clinical communication training tool using the CliniSpaceTM platform. The Wisconsin Technology Enhanced Collaboration Nursing Education (WI-TECNe) program is a nursing faculty development initiative funded by the Health Systems and Research Administration (HRSA). The goal of WI-TECNe is to enhance gains in patient safety and drive improvements in health care quality by insuring that nurses are well prepared to use information technologies in support of patient care.